To put it simply, Wrestlemania 35 was the best Wrestlemania in years! While I don’t think any of the matches on the card will go down as all-time greats, it was a terrifically satisfying show for almost the whole way through. Some might argue that there weren’t any big surprises, but I would disagree and say that the fact the show delivered on the results the fans wanted (particularly the “big trifecta” of the show) was a surprise in of itself. After four straight Wrestlemanias of WWE doing what WWE wanted despite negative feedback, Wrestlemania 35 felt like a long-overdue show for the fans. Besides, I’d rather have the storylines reach the proper conclusions, even if they’re predictable, than have swerves for the sake of swerves. The show wasn’t perfect, of course, with its main problem being the aforementioned fact that it was seven and a half hours long! Sure, that’s if you count the pre-show, but considering we’re in the streaming age of the WWE Network and the pre-show isn’t just for the live crowd anymore, it’s hard to separate the pre-show from the main card, really. So yeah, seven and a half hours is just too long. But for a show so long it would test even Peter Jackson, WWE did a pretty good job at pacing the show. I’ll try to keep this as short as possible, so here’s a quick rundown of the matches. Considering the talent between both competitors, this was predictably a good match. But it also suffered from the same fate of the past few Cruiserweight title matches at Wrestlemania: it was the first match on the pre-show, which means WWE didn’t treat it with much enthusiasm, and so it was hard for the crowd to be too enthusiastic. Tony Nese won the title at the end of a good match that could have (and should have) been given a few more minutes and put on the main card (even the opening match on the main card would help). It will be interesting to see where WWE’s cruiserweight “205 Live” brand goes from here seeing as Buddy Murphy was its centerpiece for so long. The good news, the show could only go up from here. The bad news, the match itself was bad. Aside from the annual Royal Rumble in January, battle royals tend to be a bore, with too much going on and no real story. Fans expected (and wanted) Asuka to win, seeing as WWE did her wrong by taking the Smackdown Women’s title off her mere weeks before Wrestlemania. But when she ended up getting tossed out of the ring by Sara Logan, we at least hoped she would win, seeing as she’s someone who could have benefitted from the win (and lord knows WWE needs to start making these Wrestlemania battle royals mean something). But nope, Carmella (a former Women’s champion and far from the best wrestler in WWE’s women’s division) had played possum and sniped the win. Okay? What’s the point? This match was announced mere days before the show, so it’s hard to be too enthused. The match was okay for what it was, but it was mainly an excuse to give Curt Hawkins his ‘Wrestlemania moment” by ending his 269 match losing streak (an exaggerated number). Suffice to say, the titles changed hands with Curt Hawkins scoring the pin. Not terrible, but again, kind of hard to get excited when a match has no hype before the show. Aaaand we’re back to pointless Wrestlemania battle royals that still have yet to lead to anything meaningful for the victor. I don’t even know what to say. The insanely predictable win went to Braun Strowman, which was the right choice given the circumstances. But how did Braun Strowman get into this position? Mere months ago he was one of the most popular acts on WWE RAW. Now he’s in a battle royal on the pre-show of Wrestlemania, with the only story in the match being Strowman not liking a couple of guys from Saturday Night Live (Michael Che and Colin Jost), who were also in the match and were the last men eliminated. Last year, let us not forget, Braun Strowman won the RAW tag team belts with a ten-year old kid. But at least that felt very much in line with Strowman’s character. But a grudge with SNL guys in the middle of a battle royal on the pre-show? How did Strowman fall this far this fast? This was…a pleasant surprise. The match itself was only about two minutes officially, but Lesnar attacked Rollins for a good while before the match (as bad guys do), so you could argue it was technically longer than that. This ended up being the first of the “ultimate feel good trifecta” of the night. After Lesnar brutalized Rollins for a few minutes, the match officially began and Lesnar began with his usual barrage of German suplexes, only to be pushed into the referee by Rollins. With the ref temporarily blindsided, Rollins hit a low blow on Lesnar (which is totally a heel tactic, but the commentators justified it as “turnabout being fair play” given that Lesnar cheated first). Rollins then kicked Lesnar in the face, and gave him three of his still-waiting-for-a-rename stomp finisher to win the title. While this was an abrupt match, making the top title on the RAW brand – which featured Brock Lesnar, no less – the first on the show was surprising. Going into the show, everyone expected one of the three big matches would end in disappointment, with this match being the one most pegged to take that spot with Lesnar retaining. So this was a wonderful surprise. And despite its short length, it was a very exciting match. Reminiscent of Lesnar’s bouts with Goldberg a few years back, with a few short minutes of both men’s big moves on repeat. Very fun. This match was…disappointing. Not bad, mind you. But it could have been better. The strange thing is AJ Styles is one of the best in-ring performers on the planet, and has had some of WWE’s best matches in recent years, but his four Wrestlemania bouts so far haven’t done him justice. At least AJ Styles won, which is the right call, seeing as Orton really has nothing else to accomplish in WWE. Again, not bad, but this had the potential to be a show-stealer. Instead, it was just a pretty good match. This was a solid and entertaining match. But again, it suffered from a lack of a proper build-up. So it felt more like a really good match from an episode of Smackdown, as opposed to a Wrestlemania match. The Usos retained the titles after pinning Sheamus*. *The Usos lost the titles to the Hardy Boyz two days later on Smackdown. Okay. I’ve already seen some mixed opinions on this one, but I’m sorry, I thought it was fun. Obviously, the Miz and (especially) Shane McMahon aren’t ring technicians, so this was no wrestling masterpiece, of course. But it was a fun brawl that saw both competitors duke it out all over the arena. Of course, being a Shane McMahon match, someone was bound to fall off of something high up. This happened at the end of the match when the Miz suplexed McMahon off a twenty-six foot scaffolding onto a mat. Though McMahon took the brunt of the damage, the story was he landed in such a way that his arm was covering the Miz, which the referee counted. This gave the heel McMahon the win, which means the rivalry will probably continue with McMahon bragging about his win while ignoring the fluke aspect of it. I’m cool with that. Given that Sasha Banks and Bayley were the inaugural Women’s Tag Team Champions, I expected them to have a decently lengthy reign to build some prestige on the belts. With that said, I’m happy to see the IIconics win the tag team titles. They’ve provided some excellent character work, and just feel the most like a proper tag team (plus, with Beth Phoenix no longer being a full time wrestler, we all knew her team wasn’t winning. And no one wanted to see Nia Jax and Tamina win). So hopefully the IIconics have a lengthy reign as heels and build up the titles themselves. The match wasn’t anything to write home about, but the genuine emotion shown by the IIconics after their win helped it feel Wrestlemania worthy. This was my most-anticipated match on the card, and I’m happy to say it was also the best one. The second of the “ultimate feel good trifecta” of the night, the match saw Kofi Kingston unseat Daniel Bryan to win his first world title after over eleven years with the company. As someone who has watched Kingston’s entire WWE career play out over the years, this really felt like something special. Not only did the match contain twenty-plus minutes of excellent in-ring work (I wouldn’t expect anything less from these two), but the storytelling was just so good, with Daniel Bryan playing a perfect heel as he mocked his own most famous character traits from his days as a beloved hero, and Kofi Kingston feeling like a genuine good guy. Part of why this worked so well is that, in stark contrast to WWE’s past few years, this whole rivalry was completely organic. With all due respect to Roman Reigns, his status as a corporate favorite made every attempt WWE made to paint him as a conquering underdog feel forced and insanely predictable. This isn’t the 80s anymore, people don’t want the good guy to be an unstoppable super hero like Hulk Hogan. It’s the reason Cena became so divisive in the 2000s, and it’s why Roman Reigns got boo’ed out of every building he stepped in despite being a face. Kofi Kingston, on the other hand, has been such a consistent performer for so long, that fans couldn’t help but love him. And after a series of circumstances (such as the injury of another wrestler seeing Kofi Kingston take his place in a match he wasn’t originally supposed to be in), Kingston’s popularity went through the roof in 2019. While WWE usually has their main event-level matches for Wrestlemania tentatively planned months ahead of time, Kofi’s rise to prominence came about through sheer fan devotion. With he exception of – ironically enough – Daniel Bryan, it’s probably been the most organic babyface ascension of this decade (and WWE beautifully weaved the parallels between Bryan and Kingston into the storyline). To be perfectly honest, I think this was one of the best feel good storylines WWE has ever done. We had a good heel champion in Bryan (betraying his lovable persona of the past and becoming a preachy, condescending exaggeration of himself), and the ever-villanous WWE chairman Vince McMahon trying to hold Kingston down. WWE managed to properly capitalize on Kingston’s newfound popularity, having him and his fellow New Day members Xavier Woods and Big E overcome various obstacles to get Kingston his spot at Wrestlemania, and had it pay off superbly at the biggest show of the year. WWE can often make it hard to justify your own fandom of them, but this, this was a well done, genuinely emotional piece of wrestling storytelling. Well done. This was a complete squash match, with Joe destroying the legendary Rey Mysterio in a minute’s time. That may sound disappointing, but on the episode of Monday Night Raw six days before Wrestlemania, Mysterio was injured, and the match was in jeopardy of being cancelled. So the fact that Mystery showed up at all was impressive, and if he had to get crushed, at least it got Samoa Joe over as an utter monster, which is how he should always be built up. Still, a shame we couldn’t have got a proper match from these two, as it could have been amazing. But what can you do? For the first time in five years, Roman Reigns was not in the main event of Wrestlemania. That’s a good thing for Reigns, because he actually is a solid wrestler. But again, no one likes the Hogan-style push anymore, and it worked against Reigns big time. Now of course, given that Reigns has overcome leukemia, he’s much easier to cheer. No matter how much people may have boo’ed him in the past, the man’s a hero for overcoming cancer. It’s also for that reason that his victory was all but guaranteed. Had this match happened months ago, I would have said McIntyre deserved the win to get some good momentum going. But again, there was no way Roman Reigns was losing his first Wrestlemania match after beating cancer. It really was the only right outcome. As for the match itself, it was okay. Both men can do better, but it wasn’t bad. Of course, it may have just suffered by the fact that the show had already been going on for an eternity by this point. I have some serious mixed feelings on this one. On one hand, they actually played off the brutality of the rivalry really well, with lots of vicious spots like Triple H ripping out Batista’s nose ring with pliers (not really, of course) and strangling Batista with a chain (somehow Triple H was the good guy in all of this). On the other hand, it was just way too long. This was almost as long as Bryan vs. Kingston, but matches like this don’t work as well in that length. Nor can Triple H at this point of his career, and nor could Batista at any point in his career (no offense). It’s weird, as the mastermind of NXT, Triple H goes out of his way for the sake of others. But as a wrestler, his ego still kind of gets the better of him with overproduced Wrestlemania entrances, and matches than get more time than they deserve. Seeing as this was Batista’s one-time return and last match, of course Triple H won. After some help from Ric Flair, a sledge hammer, and slamming Batista against steel ring steps, the Pedigree of course did Batista in. I don’t know. There were moments I liked of this match. But it could have condensed all the gruesome spots into a ten minute match and would have benefitted for it. One of the oldest traditions of professional wrestling is that, when a wrestler retires, they do so on their back. Giving another wrestler the rub of having vanquished them in defeat. Very rarely do wrestlers go against this tradition. Although fans wanted (and expected) Angle to somehow pull out the quick victory then have John Cena come in and challenge Angle to the final match we all wanted to see, none of that happened. We stuck to tradition here, and Corbin defeated Kurt Angle after about five minutes. It is a shame to see Kurt Angle retire, but he’s long past his prime. Angle may have put up an argument to being the best in-ring worker in professional wrestling history, but time’s caught up with him, so it was best that this match ended quickly. And now Baron Corbin can hopefully become a super-heel for having retired one of the most beloved WWE performers ever. As for John Cena, he strangely didn’t have a match on the show, but instead broke out his old “Doctor of Thuganomics” gimmick to interrupt a “concert” by Elias earlier in the night. It wasn’t bad, and I get that a lot of people loved to see Cena return to his old school gimmick. But for a show that was already so long, did we really need it? A short and solid match that may not have been anything special, but it was a bit of a wake-up call after the last two matches. The only real thing of note here is that Balor resurrected his “Demon” persona (in which he’s decked out in body paint and acts like a monster) for the match. Seeing as Balor has never lost in his demon persona since joining the main roster, of course he won the title here. The final match of the night was the third in the “ultimate feel good trifecta” (yeah, that’s what I’m going with). While it was a terrific match in most respects, it’s abrupt ending robbed it of reaching its full potential. This match was a big deal for the fact that it was the first time a women’s match main-evented Wrestlemania. WWE had been planning this historic main event for a year, but their original pitch was for a one-on-one match with Flair and Ronda Rousey. What WWE didn’t bank on is that, during 2018, Becky Lynch (like Daniel Bryan before her and Kofi Kingston after) would receive fan support like wildfire. Once again, circumstances forced WWE’s hand, so instead of sticking with Vince McMahon and company’s plans at all costs, they decided to listen to the fans (which should be an obvious concept for a company that puts on shows in front of live crowds). Thus, Becky Lynch found her way into Wrestlemania’s main event plans. Unfortunately, the story going into the match wasn’t as good as Kofi/Bryan for the simple fact that WWE overcomplicated it: Becky Lynch inserted herself into the Royal Rumble and won (good). Then she was suspended (in-storyline) and replaced in her match against Rousey with Charlotte Flair (Bad). Then Becky Lynch was randomly re-instated (Bad. Give us a reason!). Then Lynch was injured and put into a match with Flair where, if Lynch won, she’d be back in the main event (Okay). Then Lynch only won that match because Rousey interfered and gave Lynch a DQ victory (Huh?). And then less than two weeks before Wrestlemania, Charlotte Flair defeated Asuka for the Smackdown Women’s Title which then became an added prize in the match (was that necessary?). Truth be told, the match probably should have been a one-on-one between Rousey and Becky Lynch. But WWE letting Lynch into the match was apparently compromising plans enough for the fans, and they still had to have both Rousey and Flair in the first-ever women’s main event at Wrestlemania. I guess I can live with that, since Charlotte Flair is a great wrestler so it’s not like the match quality would suffer. But while Kofi Kingston’s organic popularity lead to a terrific narrative, WWE only compromising their main event plans instead of changing it did lead to some clunky storytelling at times. But, as stated, the match itself was really good. 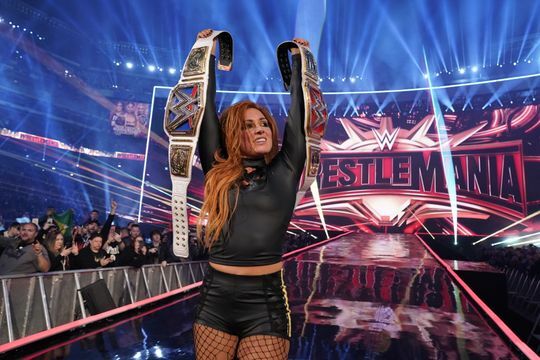 Thankfully, WWE completed the trifecta by having Becky Lynch win (seriously, the only right option). The in-ring work was great, and each woman pulled out all the stops. The only problem with the match was, unfortunately, the ending, which saw Lynch counter Rousey’s ‘Piper’s Pit’ finisher into a roll-up for an awkward pinfall. Wouldn’t the ideal ending to this story arc be for Lynch to make Rousey tap out (seeing as Lynch has a submission finisher!)? Wouldn’t that be the definitive victory for our beloved babyface to end the show? And if WWE wanted to protect Rousey, they could have had Charlotte be the one to tap out. I’ve already seen a lot of people questioning whether or not this was the planned finish, as it really did seem to come out of nowhere. Either way, it wasn’t the right way for Lynch to get her (deserved) Wrestlemania victory. Either WWE botched the ending to the first-ever women’s main event at Wrestlemania, or they gave Lynch a victory that was unsatisfying. Now, don’t get me wrong, the match was great. And Becky Lynch winning to close the show was the only way to go. But this was a seven and a half hour show with an ending that couldn’t have been more abrupt. It needed the proper heroic ending to close the show, but we didn’t get that. People like to joke about The Lord of the Rings: The Return of the King having multiple, lengthy endings. But that was the only proper way for Peter Jackson and company to go. They had an epic trilogy comprised of rather long movies that told one overarching story. It would have felt entirely anti-climactic to have a brief ending. Imagine if Return of the King had an abrupt, blink-and-you’ll-miss-it ending. It would feel rather anticlimactic after investing so much time and imagination to the trilogy. Basically, what I’m getting at is, especially with Wrestlemania 35 being this long, it needed a better ending to its main event. But again, the main event itself was great. And seeing Becky Lynch holding both Women’s titles was a perfect closing shot. It will be interesting to see where WWE goes from here. 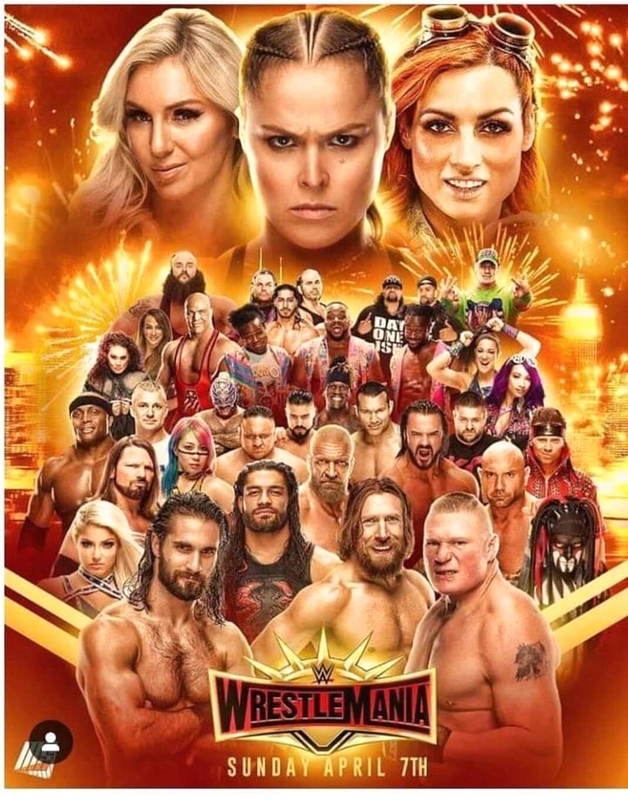 After the last few years have seen the company do their own thing no matter how increasingly low ratings suggested it was the wrong course, Wrestlemania 35 felt like a hard reset, giving the fans what they wanted and seeing how it goes. Boy, does it feel refreshing. With the exceptions of the Usos and Samoa Joe, every title changed hands on the show (and in the case of the Usos, they lost their championships two days later, so Joe is the only wrestler to walk in and out of Wrestlemania week with his title on WWE’s main roster). I assume the Women’s Championships will be unified, which makes sense. Even though WWE has never had a better women’s roster than they have now, it’s still not quite big enough to be split in half between both RAW and Smackdown. Have one show dedicated to the entire women’s division, or just have the whole division appear on both shows. I also kind of hope some other titles get unified (like both tag team titles) because, as you can see just by reading this, WWE has way too damn many titles! I don’t see them unifying the WWE and Universal titles though, since they’ve really been trying to build the Universal title as an equal to the original WWE title despite not being around that long. And WWE surely doesn’t want the Universal title to feel like a failure by unifying it after only a few short years. But seriously, let’s unify all the other similar titles with each other at least. Wherever WWE goes from here, good or bad, at least their new direction got off to a killer start with Wrestlemania 35. The show on the whole was too long, as was the Tiple H/Batista match, and Kurt Angle’s final match wasn’t always sad for the right reasons, but it was also one of the most satisfying Wrestlemanias of all time. Yes, that means it came with some predictability. But again, give me logical, satisfying predictable conclusions to storylines over forced and dumbfounding swerves for the sake of serves any day. After the last few years could be rough being a WWE fan, feeling like yours and everyone else’s wants were getting ignored because it wasn’t what Vince McMahon wanted, Wrestlemania 35 was a genuinely satisfying, crowd-pleasing show. I was about to say it was the best Mania since 30, but aside from Daniel Bryan’s ascension to the top, Wrestlemania 30 didn’t have too much to remember (yes, the Undertaker’s Wrestlemania Streak ended at the hands of Brock Lesnar, but that match sucked and I still think ending the Streak was a mistake). So really, Wrestlemania 35 was even better than Wrestlemania 30. I’m actually having a hard time remembering the last time Wrestlemania was this consistent since I became a fan in 2004. It didn’t exactly have an all-time classic match in terms of in-ring work (but Kofi/Bryan and the main event come close), but in terms of those “Wrestlemania Moments” WWE loves to tout about, it’s hard to think of the last time WWE created so many of them organically on one show. Is he going by The Mix now? I thought he was the Miz? Anyway, I thought it was pretty good (I could have done without the fatal four-way tag matches) but my god was it soooooooo long. I was tapped out after the Hunter/Batista match. Hahaha! Oops! Thanks for pointing that out. It’s that darn autocorrect. I didn’t have the chance to proofread everything right away, and since it “corrected” Miz to Mix, I didn’t catch it since ‘Mix’ wasn’t misspelled and thus, not highlighted. Thanks for pointing that out. I know many fans would act like I’m “not a real fan” for not having watched during the Attitude Era, but I did technically watch a little bit here and there in the 90s, knew who the big names were, and played the video games. 2004 was just when I started watching regularly. I have caught up with the past though, and I must say, I’m one of those guys who doesn’t think the Attitude Era was that good. 90s “shock value” hasn’t aged well at all. It’s definitely a product of its time and viewed through the sensibilities of today is a crass product but certainly had a nostalgic charm to it. The Austin/McMahon angle, the Rock vs DX trading blows week in week out. Continued watching (intently) until the end of 2011ish.